When OpenDrive implemented WebDAV as an available platform for accessing and working with files stored on their servers, the possibilities for cloud storage, for both personal and business applications, became endless. Before this protocol was implemented, any types of advanced file or folder functions could only be performed through the Windows and Mac applications, while there was limited functionality within their website and mobile apps. Although the Windows and Mac apps are some of the most versatile and powerful cloud storage solutions available, they are limited by platform and infrastructure. People and businesses alike, operating Linux based computers and servers, as well as business systems that have limitations and restrictions, found it difficult to perform the functions necessary to be productive within the cloud by simply using the website. This proved tedious, time consuming and extremely inconvenient. The implementation of WebDAV, however, removed all limits on cloud computing, allowing even third party apps to be used to connect to your OpenDrive account. Since WebDAV is still in Beta, OpenDrive has been exploring the different third party options available, as well as options within operating systems themselves, such as network drive mapping, to see which ones are the best fit for their customers needs. We will take a look at some of the methods of using WebDAV through third party applications and will provide our recommendations on the best software applications to use for this purpose, the ones that provide the most stability, speed, security and convenience. Cyberduck: A free Windows and Mac compatible client that supports FTP, Secure FTP and WebDAV, among other protocols. They have an extremely simple interface designed to make connection to any FTP or WebDAV server quick and easy, including connection to your OpenDrive account. Within minutes, you can be up and running, performing file and folder functions between your local machine and the OpenDrive cloud without having to install any proprietary software on your system. CrossFTP Pro: This is a multiple-platform solution designed to bridge Windows, Mac and Linux systems. Also easy to configure, CrossFTP runs like the standard FTP client and provides easy of use and security to the OpenDrive user. Batch functions and scheduling make this a more comprehensive solution to your cloud computing needs. ES File Explorer: A long time favorite for those looking to access the files on their Android device’s root, OpenDrive customers have also found it to be an excellent way to connect to their account through WebDAV. Optimized for mobile file transfer, there are no hiccups, regardless of whether you are performing functions with a WiFi or 4G cellular network connection. WebDrive: A premium Windows and Mac based client that supports everything Cyberduck does, while adding the ability to map your OpenDrive account, through the WebDAV protocol, as a network drive. This eliminates the need to install and run the OpenDrive software each time you wish to access your files on the cloud. Instead, a virtual drive is created just as if it was a local hard drive connected to your computer. WebDrive also adds the ability to connect through your Android or iOS device, making this the most complete 3rd party WebDAV solution and well worth the $39.95 price for the full, unrestricted version. 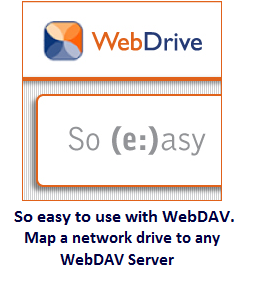 Although there are several hundred other options available, we have found that these applications work the best with OpenDrive’s WebDAV servers and you can rest assured that, no matter which platform you are on on which device, one of these apps will help you seamlessly integrate OpenDrive into any existing network or infrastructure. To read the full article from 2014, click here. NOTE: WebDrive now costs just $39.95! Interested in trying WebDrive? Download a free trial below!